Why do some serious Broadway shows flop while others don’t? A scene from “The Last Ship,” which will close Jan. 24 at a loss of $15 million. Why are some serious-minded Broadway shows hits while others flop? If you knew the answer you could make a very nice living. But the formula remains a mystery and Patrick Healy’s fascinating piece in the New York Times explores why. God knows, nobody could have done more to promote “The Last Ship” than Sting did. He even joined the cast to sell more tickets. Producers this week announced the show will close Jan. 24 when his stint was scheduled to end, losing their entire $15 million investment. 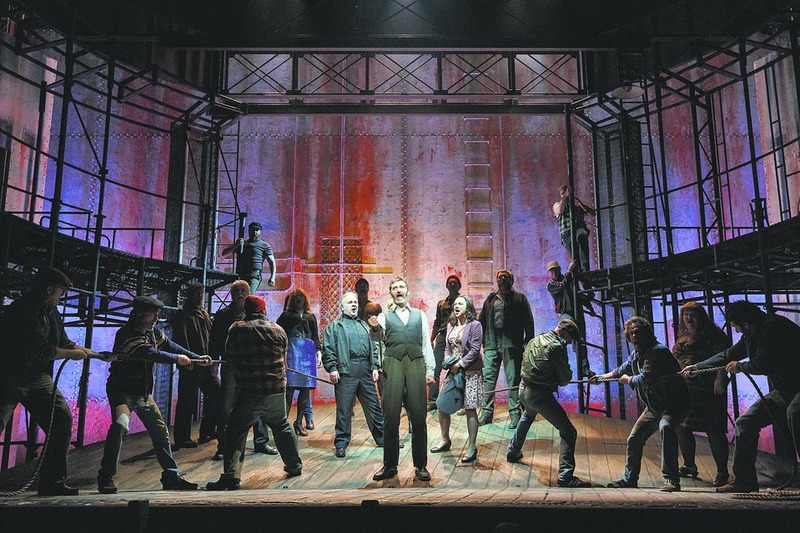 Healy writes: (Producer Jeffrey) Seller said that he had no theories for why more female theatergoers (who make up about 70 percent of Broadway audiences) and Sting fans did not embrace “The Last Ship,” about the troubled lives of shipbuilders and young people in a struggling British town. He does admit, Healy adds, the marketing campaign didn’t push the love angle as it probably should have. But if good marketing alone sold shows, wouldn’t there be more hits? To order tickets for the show, visit its website here.